It is moist, firm, great hot or cold, excellent in salads and pastas. Caught in the pristine waters of Alaska. Wanting the great taste of Alaska to come directly to your door then check out the most sought after crab legs around with these enormous King Crab Legs. Their shells are made by nature to protect the most flavorful meat for you to savor. With King Crab Legs you can entertain any guests with confidence knowing you are serving the most heavenly crab meat directly from the cold waters of the Bering Sea. King Crab Legs are perfect for the most extravagant dinner with their delicate succulent meat they are a definite crowd pleaser for any palate. If you are a professional caterer then this is the product for you. Catering a wedding is easy with our King Crab Legs delivered directly to you to make your catering experience the most convenient and profitable for your business. So whether you are a professional caterer or just want your friends to think you are King Crab Legs will let everyone know that you have impeccable taste. 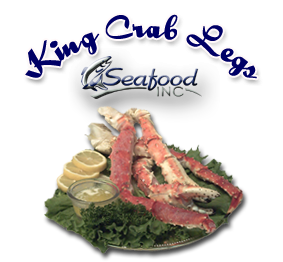 As a fresh king crab supplier we ship fresh and frozen king crab legs worldwide. Seafood Inc is dedicated to superior quality of its frozen and fresh king crab.